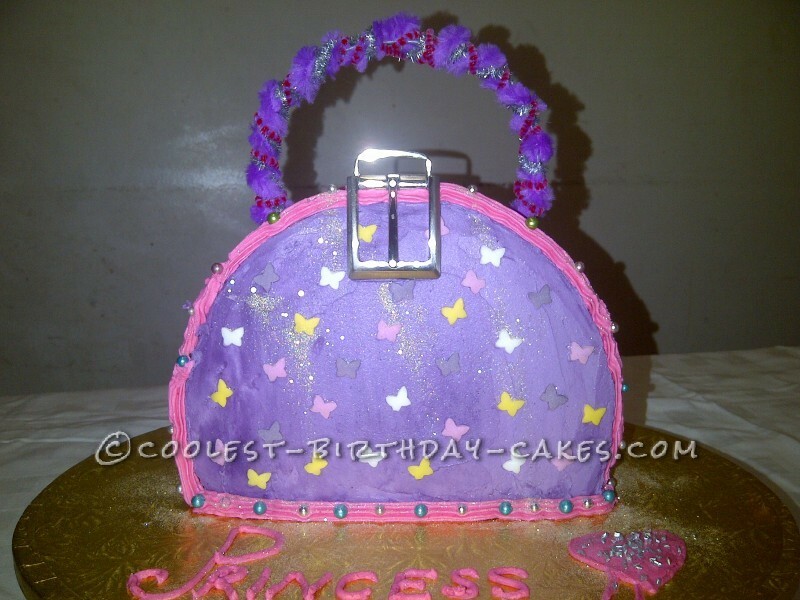 This Princess handbag cake is definitely one of my better cakes. I made this for my 10 year old daughter who has an obsession with purple. I didn’t have a clue about how I would get the cake to stand upright, so I Googled a few pictures and watched a few youtube videos. I must say the snippets of information that I used from there really helped. I baked two round cakes. 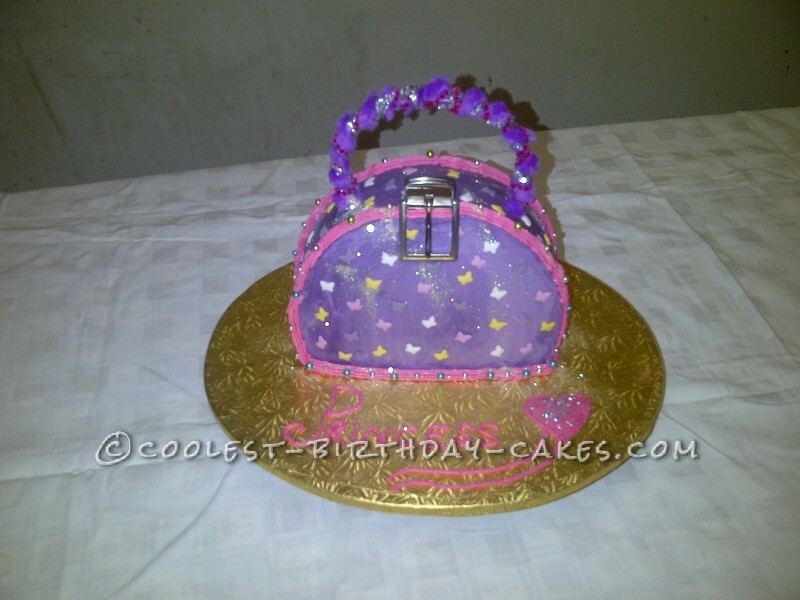 The trick that I learnt was the freezing of the cakes for 15-20 minutes at a time between steps during the icing process. I cut off a very small portion of the cakes on the side so that it could form the base. The first step was “crumb coating”- an absolutely new step to me as I am definitely an amateur. This involves spreading a thick layer of butter icing on the cakes just to seal the crumbs, then freezing it for another 20 minutes. When you take it out of the freezer, you can then slice away the extra icing with a spatula dipped in warm water. This gives you the smooth finish. This is done a second time if you really want to. I was impressed with the effect and it was a true learning curve for me. 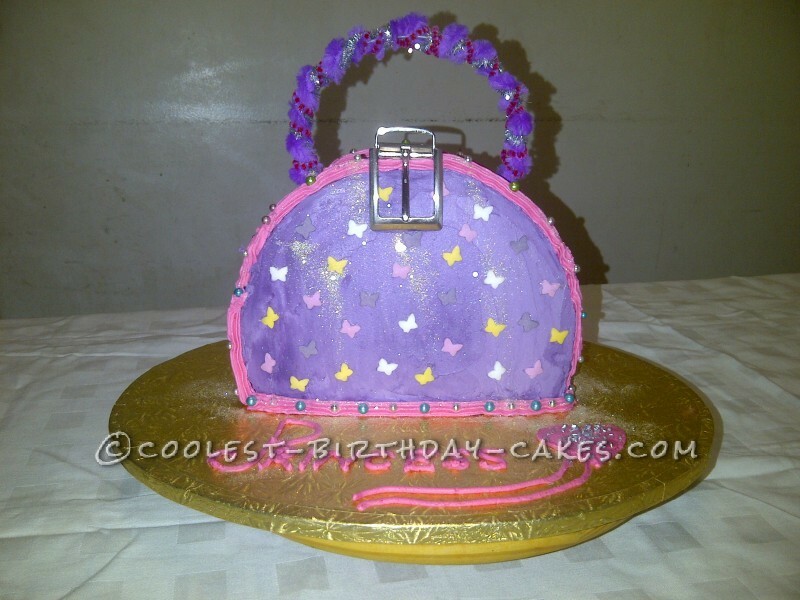 Once I had the icing on the cake as smooth as needed, I piped over the edges and used glitter sprinkles and butterflies to create the effect. We twisted craft wire for the handbag handle, and an old buckle from Dad’s broken belt completed the handbag. My daughter was ecstatic and I must say I was too!